The prophet Ezekiel’s words open up radical hope, the hope of the Lenten season—that the sins of the past can be forgiven. Like Joe Hoover’s provocative reflection on Graner a few days ago, today’s readings propose that anyone can be saved if they turn from their sin. But I have to say I’m struggling with that message today. What about collective sin that has never been acknowledged? Last evening, I spoke with Oliver de la Paz’s class about Sand Opera, and found myself in the middle of its muddle again. There are times when I’m giving a reading that I want to read anything but these poems; how strange it is to have to be inside that prison again, to have to voice the words of prisoners. I want to be free of those voices now, at the same time that I can’t be rid of them. I want to believe in forgiveness, but I struggle with the idea that my country has failed to come to terms in the most fundamental ways with the havoc that we have wreaked on Iraq—not just during the Iraq War, but the Persian Gulf War twelve years before that. Today’s poem works with the voice of the man whose image became known as the Abu Ghraib man, Abdou Hussain Saad Faleh. And while I have refused to show images from the scandal, this one is so iconic, so rife with Christian imagery, that it should be shared. Notice, in particular, the juxtaposition between the hooded man and Staff Sgt. Ivan Frederick, fiddling with his camera. The mystery of the Christian tradition is the proposition that Jesus’s suffering is an act of redemptive love that cleanses all of humanity. That is the Easter story. The most famous image from the Abu Ghraib prison scandal was that of the so-called Abu Ghraib Man, whose position ironically echoed the crucifixion of Jesus. 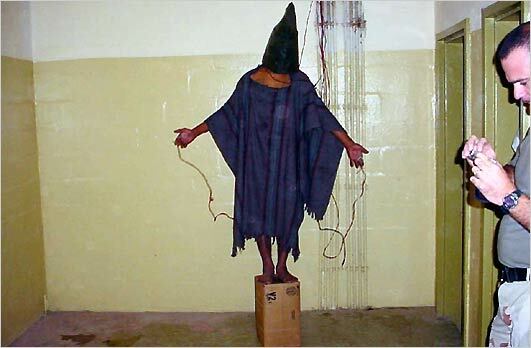 One might read the story of Abu Ghraib as the story of the ongoing crucifixion. Dr. Susan Averna’s reflection on this poem as part of trauma work points us toward the healing that might be possible, simply by being with such voices. That is my hope, even as I struggle with it today. Trauma – powerlessness over violation (“made me,” “made me”) and threat of harm or death. The fragmented composition captures beautifully the nature of traumatic memory. Splintered memory, body sensations, the body’s amazing capacity to dissociate and shut down episodic memory for self-preservation while reliving every feeling, sight, sound, smell. The aftermath of trauma is the enemy outside living within. The event is over but the body keeps reacting --feeling states of panic, rage, fear. Healing comes from regaining trust, befriending the body and finding the capacity to feel safe again. The origins of your work “began simply a way to be with those prisoners.” In trauma work, or any kind of emotionally healing work, a critical concept is “being with.” It goes beyond bearing witness. It is feeling and holding space for the experience of another. More than any comforting words or sympathetic gestures, it is entering into another's pain by connecting with your own experiences of loss, grief, violation, etc. (and being with that person in the pain). It creates a connection and conveying of understanding that lifts the shame and allows for the person to be seen and heard and to find language for the unspeakable. Susan Averna, PhD is a psychologist, college professor, mindfulness educator, and registered yoga teacher. Specializing in developmental trauma, she works with individuals and groups to build resilience, cultivate self-compassion and optimize well-being. She provides consultation and professional development to school teachers and staff to reduce burnout, address barriers to teaching and learning, and support the well-being of educators and students. Last year, during Lent, our parish worked the theme of forgiveness. "Worked" is an apt word, because forgiveness, as we learned from the teachings of Archbishop Tutu, is a "four-fold" path, but to move toward it we must choose to get off the revenge cycle. What is most interesting is that it takes pain to either choose to harm (continue the revenge cycle) or choose to heal; it is only after choosing to heal that one can begin the journey on the four-fold path. The first step down that path is to tell the story. Today's story comes to us in both visual and narrative form. Here, the visual storytelling is supreme. Too often words are inadequate to convey just how awful the story is, and so we let our pictures, which we cannot un-see in our minds, do our telling for us. The second step is to name the hurt. How enormously difficult that is, when unimaginable pain is inflicted on those marginalized to begin with, thought of as somehow "lesser than", and deprived of a voice, which this post also emphasizes can be difficult to hear. Again, we can let an image speak when words fail us. The third step is to grant forgiveness, which requires recognizing our shared humanity, identifying that place where we are both wrong and both right. If we are afraid to see, Archbishop Tutu says, then it is understandable that we would be afraid to forgive, because when we look, we see ourselves and must recognize we, too, are broken. Forgiveness is a solo act, not for the person who caused the hurt but for the person who suffered it. It does not require forgetting. And by not forgetting, we can always see. The fourth and last step is choosing to renew or release (let go) the relationship that brought pain. This step reminds us that we are but a step away from falling back into the revenge cycle. It is so important that Abdou Hussain Saad Faleh is named in this post. His name, not "The Abu Ghraib Man", is his identity. To give him back his identity, we have to be willing to speak his name. When we speak his name, we see him. The first time I saw the image in this post, I heard only, "My God, my God, why hast Thou forsaken me?" Those same words instantly came to mind today when I clicked open this post. The gesture of supplication, the hood that keeps us from seeing into Faleh's eyes, the shock we know is coming . . . where is God in this? I struggle mightily with forgiving the depravity endured in Abu Ghraib prison, at the black sites, during every war, in our prisons, on our streets, behind the closed doors of our homes. Yet I also acknowledge the truth in Thomas Merton's words, "Our job is to love others without stopping to inquire whether or not they are worthy. . . [It] is love itself [that] will render both ourselves and our neighbors worthy." "The origins of your work 'began simply a way to be with those prisoners.'" When I enter or leave the prison I visit, I hear the men groaning from the windows at full volume - like lone sea gulls but without tone. Perhaps more like an air raid siren from the darkness of the heart. I carry that anguish within me, as I was recently reminded when I watched Camus' "The Stranger," produced by Visconti. I cringed at the sounds of the same plaintive cry from the Algerian prison where Mearsault was kept. The prisoners are also with me.